Yoichi Shimatsu writes: News of a third explosion at the Fukushima nuclear power plant sent stocks plunging on the Nikkei exchange which dropped 1,015 points on the session. After 2 days of battering, the stock index is off more than 1,600 points in its worst performance since Lehman Brothers failed in September 2008. Japanese Prime Minister Naoto Kan has ordered the evacuation of all people living within a 18 mile radius of the power station and warned homeowners to remain indoors to avoid contact with "elevated levels of radiation". "Substantial amounts of radiation are leaking in the area," Kan said in an emergency broadcast on television at 0200 GMT. Already, the disaster at Fukushima is the second biggest nuclear catastrophe on record, just behind Chernobyl, but reactor volatility suggests that the problem could persist for some time to come, perhaps months. Making matters worse, the wind over the radiation-leaking nuclear plant in northern Japan will blow inland from the northeast and later from the east on Tuesday, the Japan Meteorological Agency said, according to Reuters. Harmful radiation can spread via wind and rain. The magnitude of the crisis is hard to grasp. Another two reactors saw their cooling systems breakdown late Monday increasing the probability of a meltdown. So far, there have been 4 explosions and 3 fires at various reactors following the devastating 8.9 earthquake and tsunami. "Now we are talking about levels that can damage human health....Please do not go outside. Please stay indoors. Please close windows and make your homes airtight. Don't turn on ventilators. Please hang your laundry indoors." The radiation level in the capital, Tokyo, was recorded at 10 times normal on Tuesday evening, but the city government said there was no threat to human health. The prevailing winds have since shifted sending the radioactive material out to the Pacific Ocean. "The pools, which sit on the top level of the reactor buildings and keep spent fuel submerged in water, have lost their cooling systems and the Japanese have been unable to take emergency steps because of the multiplying crises. The bad news is that if efforts to deal with the emergency fail, the results could be worse. The pools are a worry at the stricken reactors at the Fukushima Daiichi plant because at least two of the three have lost their roofs in explosions, exposing the spent fuel pools to the atmosphere. By contrast, reactors have strong containment vessels that stand a better chance of bottling up radiation from a meltdown of the fuel in the reactor core. Were the spent fuel rods in the pools to catch fire, nuclear experts say, the high heat would loft the radiation in clouds that would spread the radioactivity. “It’s worse than a meltdown,” said David A. Lochbaum, a nuclearThe Wave, reminiscent of Hokusai's masterful woodblock print, blew past Japan's shoreline defenses of harbor breakwaters and gigantic four-legged blocks called tetrapods, lifting ships to ram through seawalls and crash onto downtown parking lots. Seaside areas were soon emptied of cars and houses dragged up rivers and back out to sea. Wave heights of up to10 meters (33 feet) are staggering, but before deeming these as unimaginable, consider the historical Sanriku tsunami that towered to 15 meters (nearly 50 feet) and killed 27,000 people in 1896. Nature's terrifying power, however we may dread it, is only as great as the human-caused vulnerability of our civilization. Soon after Christmas 2004, I volunteered for the rescue operation on the day after the Indian Ocean tsunami and simultaneously did an on-site field study on the causes of fatalities in southern Thailand. The report, issued by Thammasat and Hong Kong Universities, concluded that high water wasn't the sole cause of the massive death toll. No, it's buildings that kill - to be specific, badly designed structures without escape routes onto roofs or, in our greed for real estate, situated inside drained lagoons and riverbeds, or on loose landfill. In the Tohoku disaster, an ultramodern Sendai Airport sat helplessly flooded on all sides while nearby a monstrous black torrent swept entire houses upstream. Other threats are built into the vulnerabilities of our critical infrastructure and power systems. The balls of orange flames churning out of huge gas storage tanks in Ichihara, Chiba, should never have happened if technical precautions had been properly carried out. Whenever things go wrong, underlying risks had led to a liability and, in a responsible society, accountability. Most people assume that the meticulous Japanese are among the world's most responsible citizens. As an investigative journalist who has covered the Hanshin (Kobe) earthquake and the Tokyo subway gassing, I beg to differ. Japan is just better than elsewhere in organizing official cover-ups. The recurrent tendency to deny systemic errors - "in order to avoid public panic" - is rooted in the determination of an entrenched bureaucracy to protect itself rather than in any stated purpose of serving the nation or its people. That's the unspoken rule of thumb in most governments, and the point is that Japan is no shining exception. So what today is being silenced on orders from the Tokyo government? The official mantra is that all five nuclear power plants in the northeast are locked down, safe and not leaking. The cloaked reality is that at least one of those - Tepco's Fukushima Nuclear Power Plant - is under an emergency alert at a level indicative of a quake-caused internal rupture. The Fukushima powerhouse is one of the world's largest with six boiling-water reactors. Over past decades, the Japanese public has been reassured by the Tokyo Electric Power Company that its nuclear reactors are prepared for any eventuality. Yet the mystery in Fukushima is not the first unreported problem with nuclear power, only the most recent. Back in 1996 amid a reactor accident in Ibaraki province, the government never admitted that radioactive fallout had drifted over the northeastern suburbs of Tokyo. Our reporters got confirmation from monitoring stations, but the press was under a blanket order not to run any alarming news, the facts be damned. For a nation that's lived under the atomic cloud of Hiroshima and Nagasaki, total denial becomes possible now only because the finger on the button is our own. Despite the national addiction to nuclear power that keeps the neon lights bright over Shibuya's famous corner, Japan still remains the most prepared of all societies for earthquakes, tsunami, conflagrations and other disasters. Every work unit, large or small, has an emergency response plan. The Tohoku quake hit on a workday afternoon, meaning the staff in every factory and office could act as a team to quell small fires, shut the gas lines, render first aid and restore their communication system. Even in most homes, residents have a rechargeable flashlight plugged into a socket and emergency bottles of water. Northeast Japan is better prepared than other localities because in the wake of the Kobe quake in 1995, the regional Keidanren, or federation of industrial organizations, sponsored a thorough risk-management and crisis response study. Tohoku Keidanren staffers, who had known of my reporting on the San Francisco and Kobe quakes, asked me to write an article prioritizing disaster preparedness. First on my list was a people-based communications network such as the citizen's band radio that enabled Northern Californians to self-organize despite power blackouts. That point directly led to the fast licensing of new mobile phone towers equipped with back-up batteries. Second was independent power generation inside all major factories so that these large facilities could recharge batteries, provide lighting and pump water for their neighborhoods and, if necessary, offer shelter, sanitation and medical care. These systems must be routinely used at least on weekends so that the equipment is regularly checked and the staff stay familiar with their operation. .Third, and most important, is the ability of individuals to rally as a self-sustaining community. In Kobe, society collapsed under a sense of personal defeat. In San Francisco, by contrast, neighbors reached out as friends and opened their doors, food stocks and hearts to victims and their kin. Without compassion, each of us is very much alone indeed. As participants in communities, who can suddenly find themselves naked before unthinkable hazards, we must act to defuse the deadly "bomb" that provides us lighting, energy for appliances and air-con. Prevention of the next Chernobyl or Three Mile Island begins when we stop naively believing in the cost efficiency of uranium, and for that matter the cleanliness and healthiness of "clean" coal. Japan has vast untapped reserves of offshore wind energy, the only practical alternative to nuclear power and fossil fuel. Yet the nuclear lobby, coal companies and oil majors have strong-armed the government and industry to stubbornly refuse to invest in advanced and efficient turbine engineering, including magnetic-levitation rotors that eliminate the need for energy-sapping bearings. At certain stages of societal evolution, there arrives an unmistakable message to leave behind our worn-out security blanket and surf the wave of the future. The tsunami is just such a signal arising from the ocean's depths to awaken Japan, as a global technology leader, to push much faster into a cleaner, greener and safer world. Meltdown is underway. Japan's Industrial Nuclear Safety Agency reported that the radioactive isotopes cesium and iodine were detected by a monitoring station in the Fukushima No.1 nuclear power plant. The presence of these substances in air samples is a sure indicator that an uncontrolled chain reaction has started. Overheated uranium rods have eaten through their protective metal casings and have started nuclear fission. The regulatory agency's announcement overturns the earlier claim of plant operator TEPCO that all uranium rods were intact. The National Institute of Radiological Science, in Chiba outside Tokyo, has flown a team of doctors and nurses by helicopter to a health center 5 km from the Fukushima plant to monitor nuclear exposure in workers, emergency crew and local residents. Nuclear workers, who this morning restarted the pumping of cold water into the reactor, are being hampered by aftershocks of larger than Richter 6. Plant operator TEPCO ordered the release of steam from the overheated reactor this morning because internal pressure is twice higher than the allowable limits of the original facility design. Plant officials say that the steam is being filtered of radioactive particle. Outside the plant, however, the monitoring station detected outdoor radiation levels 8 times higher than normal, indicating either leakage or filter malfunction. Three of the six reactors of the TEPCO Fukushima Nuclear Power Plant, were operating at the time of the Tohoku quake. The failure of back-up generators caused significant rise in temperatures inside No.1 (46 MW output) and No.2 (784 MW) reactors. The Japanese government overnight dispatched truck-mounted power generators to both plants in order to restart cooling pumps. On-site back-up batteries that run the control system were depleted of power within 8 hours of the blackout. Authorities are now locating robots to dispatch for remote control repairs to the reactors because the interior is unsafe for human employees. The Pacific jetstream is currently flowing due east directly toward the United States. 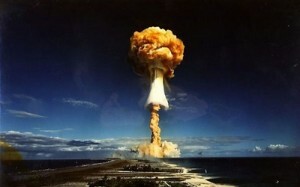 In the event of a major meltdown and continuous large-volume radioactive release, airborne particles will be carried across the ocean in bands that will cross over the southern halves of Oregon, Montana and Idaho, all of California, Nevada, Utah, Colorado, Wyoming, the Dakotas, northern Nebraska and Iowa and ending in Wisconsin and Illinois, with possible further eastward drift depending on surface wind direction. Most of the particles can be expected to travel high in the atmosphere, with fallout dependent on low pressure zones, rainfall and temperatures over the US. If a meltdown can be contained in Fukushima, a small amount of particles would be dispersed in the atmosphere with little immediate effect on human and animal health. Another climate factor to be taken into account is the potential for an El Nino Variable bulging the jetstream further northward, causing fallout over western Canada and a larger number of American states. Seasonal rainfall over Japan does not normally begin until mid-April and does not become significant until early June. If very high radiation releases are detected at some point, a potential tactic to lessen contamination of North America is for the US, Canadian and Russian air forces to seed clouds over the northwest Pacific to create a low pressure front and precipitation to minimize particle mass reaching North America. Ohoku Quake and Tsunami Monitor 2: "The Good News Guys"
Following a high-level meeting called by the lame-duck prime minister, Japanese agencies are no longer releasing independent reports without prior approval from the top. The censorship is being carried out following the imposition of the Article 15 Emergency Law. Official silencing of bad news is a polite way of reassuring the public.According to the chief Cabinet Secretary, reactor heat is being lowered and radiation levels are coming down. The Unit 1 reactor container is not cracked despite the explosion that destroyed its building. The explosion did not erupt out of the reactor. So what caused the explosion that blasted away the reinforced concrete roof and walls? Silence. Yes, there's nothing to worry about if residents just stay indoors, turn off their air-cons and don't breathe deeply. Everyone, go back to sleep. The radiation leak at Fukushima No.1 nuclear plant is now officially designated as a "4" on the international nuclear-events scale of 7. This is the same criticality rating at an earlier minor accident at Tokaimura plant in Ibaraki. Technically, there is no comparison. Tokaimura did not experience a partial meltdown. The mayor of Tsuruga City, home of the trouble-plagued Monju plutonium-breeder reactor in Fukui Prefecture, isn't buying Tokyo's weak explanation about the Fukushima 1 blast and demanded the Nuclear and Industrial Safety Agency to conduct an all-points investigation immediately. A specialist medical team from the National Radiology Health Institute, flown by helicopter from Chiba to a field center 5 km from the No.1 Nuclear Plant, found radiation illness in 3 residents out of a sample group of 90. Overnight that number of civilian-nuclear "hibakusha" shot up to 19, but in other counts to 160. The evacuation zone has been further widened from 10 km to 20 km. A third reactor, Unit 6, has lost its cooling system and is overheating along with Reactors 1 and 2. Fukushima No.2 plant, further south, is ringed by a wall of silence as a quiet evacuation is being conducted. Firefighters are pumping seawater into the three overheated Fukushima 1 reactors. The mandatory freshwater supply is missing, presumably due to tsunami contamination from surging ocean waves. An American nuclear expert has called this desperation measure the equivalent of a "Hail Mary pass".. So, the Prime Minister should be hoping that Japan's tiny Christian community is feverishly praying. Because right now, Japan and much of the world are living on a prayer. USA: The White House sent in a team to consult withe US-friendly Naoto Kan government. Instead of dispatching in experts from the Department of Energy, Nuclear Safety Agency and Health Department, President Obamas sent representatives of USAID, which is cover for the CIA. The presence of these paranoiac bumblers only confirms suspicions of a top-level cover up. Why would the Agency be worried about the disaster? There are security considerations, such as regional "enemies" Pyongyang, Beijing and Moscow taking advantage of the crisis. To the contrary, China and Russia have both offered carte blanche civilian aid. Second, to coordinate a pro-American public campaign synchronized with the US relief effort from the nuclear carrier USS Ronald Reagan. Many Japanese might actually be alarmed by Navy ships offshore, reminding them of the firebombing campaign in the big war, and US helicopters rumbling overhead as if Sendai was Danang Vietnam 1968. The whole "aid" exercise smacks of a con job aimed at keeping US military bases in Okinawa and surreptitiously at a Japanese Self-Defense Force firing range at the foot of Mount Fuji. Third, to ensure the safekeeping of Misawa Air Force Base in quake-hit Iwate Prefecture. Misawa, the hub of US electronic warfare and high-tech espionage in East Asia with its fleet of P-3 Orions and an ECHELON eavesdropping antennae. PRC: In contrast to Washington's ulterior motives, China in an unprecedented move has sent in an emergency team into Japan. Unbeknownst to the world, China has world-leading expertise in extinguishing nuclear meltdowns and blocking radiation leaks at their uranium mines and military nuclear plants. This was discovered on a 2003 visit to a geological research center in the uranium-rich Altai mountain region of Xinjiang, where a scientist disclosed "off the record" China's development of mineral blends that block radiation "much more than 90 percent, nearly totally". When asked why the institute doesn't commercialize their formulas, he responded: "We've never thought about that." That's too bad because if one of China's exports was ever needed, it's their radiation blanket. Russia: Moscow too, is offering unconditional aid, despite ongoing territorial conflict with Japan over four northern islands. The Russian Air Force, from bases in Kamchatka and the Kuriles, could play a key role in cloud-seeding to prevent radioactive particles from drifting over to the United States. Americans should learn how to act as team players in an international community, especially now their own children's lives will be at stake in the event of a total meltdown in Fukushima. Canada: Meteorology is becoming evermore interesting, despite the "what me worry" attitudes of the global-warming skeptics. A freak of nature called El Nino Variable, if it occurs later this spring, could push the Pacific jet stream northward, meaning western Canada and more U.S. states could find themselves along a winding stream of radiation fallout from Japan. Correction to Monitor 1: In our haste, we blurred over some important details on the use of potassium iodide tablets. These are taken to block radioactive iodine-131 from affecting the human thyroid gland, thus lowering the risk of cancer and other disorders. "The situation is Japan is dire. It's grave, and it doesn't suit anyone's purposes to downplay it. They are engaged in desperate measures to try to prevent the cores of three reactors from completely melting down and large radiological releases that could have a major health and environmental impact on Japan. If there is a large-scale radiological release, then within tens of kilometers, people would be at risk of acute radiation exposure, that is, exposures that are so high you would see immediate and potentially life-threatening effects. Beyond 30 to 40 kilometers downwind, that threat would be lessened, but the risk of radiation exposure would still increase the risk of getting cancer significantly....There will need to be additional safeguards if we plan to have safe nuclear power in this country."